2:05 now I'm done. The S&P can go do whatever it wants. I'm heading for the Rockies. Thanks for coming. See you next week. Take a course. 1:27 retrace only about 1/3 of range; so market has held up; the question is, can it get enough volume to rally? 9/23/2011 12:11:21 PM MT mm****:: I also bailed when it reached yesterday's H of 1135.50 - also because the MT predict a drop into 14:38, when I probably re-buy - I trust the MT - have been my Guiding Lights for decades ! 9/23/2011 12:05:39 PM MT WRB:: Kidding around --- down here when trees are brown in August = dead. 9/23/2011 11:34:29 AM MT mm****:: Only brown is not good enough - it mainly has to be shades of yellow and red. 9/23/2011 11:23:13 AM MT mm****:: But talking business again: we had THREE 20/110 - crossings in 15 min - how dull can it get! 9/23/2011 11:21:29 AM MT mm****:: Well - northern Maine, next to Canada, is still NE ! 9/23/2011 11:20:24 AM MT mm****:: Al - Beats me - people may ask for their money back - LOL ! 9/23/2011 11:19:12 AM MT Al****:: MM-then why does Brendan Vacations (Brendanvacations.com) have a Fall colors tour going this week through next week? 9/23/2011 11:13:05 AM MT mm****:: Still in AWE at the MT - seeing this little jerk I did not take the 20/110 crossing right away - unless one had a 9pt stop one would have been stopped out ! 9/23/2011 10:37:53 AM MT WRB:: Don't bail on us for the next trade Al!!!! 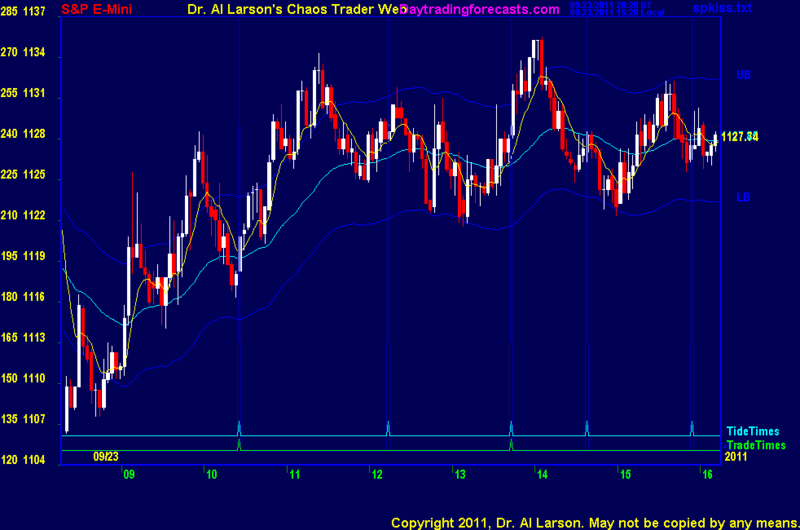 9/23/2011 7:59:59 AM MT skd:: Question: 10:26 trade.. your expecting a Sell? based on tide? also the letter "O" or number zero is their.. what does that mean? 9/23/2011 7:22:46 AM MT WRB:: Good luck to all - hoping for a fun clinic today! 9/23/2011 6:52:13 AM MT skd:: Hello, Im new here as you can see. looking forward to learning something today. Gluck... ps advise if texting is ok or not for non-members tks. 9/23/2011 4:38:28 AM MT TG****:: Futures tanking overnight back towards the lows of yesterday. Seems like 10 years ago a bit when the post 9/11 panic dropped into Friday morning 9/21 before putting on a good bear market rally.